Fitzpatrick’s Manhattan, on 57th and Lexington, is de rigeur for Irish internationals staying in the city, and John Fitzpatrick has worked for that distinction. But despite owning a cumulative 27 floors and a castle as President and CEO of Fitzpatrick Hotel Group, North America, John is one of the most down to earth people you could meet. As the second eldest of the five children of Paddy and Eithne Fitzpatrick, who owned three hotels across Ireland, John began his career by mowing the lawn at Killiney Castle Hotel in Co. Dublin during the summers when he was a teenager. Later he moved on to washing dishes in the hotel kitchen. From there, onto washing glasses, and, eventually, when he was 17, he got to mix drinks behind the bar, working every weekend while he was still in school. After these initial experiences in the industry in Ireland, John enrolled in the prestigious hotel management course at the University of Las Vegas. After graduating, he worked at two Chicago hotels before returning to Ireland, where he did not stay for long. In 1990, Fitzpatrick, with his father’s blessing, began considering various American cities as potential hotel sites, eventually landing on New York and purchasing the building that would become Fitzpatrick’s Manhattan. When the hotel opened in 1991, Albert Reynolds, who was then Taoiseach, stayed there. Then Mary Robinson, who at the time was President of Ireland, paid a visit. Then Gregory Peck choose Fitzpatrick’s. Soon, the hotel’s reputation was established. Seven years later, John opened another New York hotel, Fitzpatrick’s Grand Central, on 44th Street. When John’s mother passed away in 1994, he founded The Eithne Fitzpatrick Memorial Fund in her honor. With the death of his father in 2001, the fund became the Eithne and Paddy Fitzpatrick Memorial Fund, whose mission is to “make a significant positive impact on the lives of those in need.” Among its current projects are the Integrated Education Fund, which strives to integrate the education system in Northern Ireland, and the Corrymeela Community, which promotes reconciliation across social, religious, and political divides in the North. In addition to these peace and reconciliation initiatives, the fund, which has raised $1.3 million to date, also supports Barretstown, a summer camp for seriously ill children. In 2011, Fitzpatrick participated in RTÉ’s version of Secret Millionaire, traveling to the Muirhevnamor housing estate and Coxs Demense in Dundalk, Co. Louth, and at the end of the program gave away a total of €20,000 to the Craobh Rua Community House, €15,000 to senior citizen organization Cuidigh Linn, and €2,000 to O’Hanlon Park Boxing & Fitness Club. His donations were matched by the Eithne and Paddy Fitzpatrick Memorial Fund. 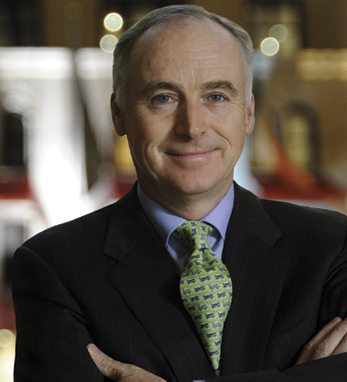 John has just been named Chairman of The American Ireland Fund and although he is the recipient of numerous other accolades (including an OBE by Queen Elizabeth II), it’s safe to say that the greatest reward for John Fitzpatrick, is the one he gets from giving back.